Perryton native and former Liberal Bee Jay player and head coach Mike Hargrove won a big award. 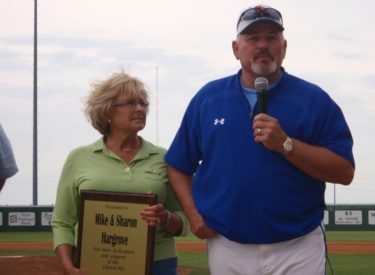 Hargrove managed the Liberal Bee Jays in 2008 and 2009. Here is more from Cleveland.com. CLEVELAND, Ohio — Cleveland Indians legend Mike Hargrove will be the recipient of the Lifetime Achievement Award during the 17th Annual Greater Cleveland Sports Awards on Jan. 26 at the Renaissance Cleveland Hotel. Hargrove, who was inducted into the Indians Hall of Fame in 2008, played for the club from 1979-85 and managed the team during its most successful playoff era from 1991-99. The Lifetime Achievement Award is given to a person who, through their personal career dedication and achievements has advanced sports in Cleveland, according to the sports commission. Hargrove played for the Texas Rangers and Indians during his 12-year career, including winning American League Rookie of the Year and The Sporting News Rookie of the Year awards in 1974. He was named one of the Tribe’s top 100 players in team history after retiring with a .290 career batting average. After a combined 21 years with the franchise, Hargrove still has close ties to the organization. “Being recognized for your life’s work is extraordinary,” Hargrove said in a press release. “But when that recognition comes from the people that know you best, it is extremely humbling. Hargrove served as manager for the Indians, Baltimore Orioles and Seattle Mariners, holding a career major league managerial record of 1,188-1,176, including 721-591 with the Indians. The Indians won five consecutive American League Central titles went to the World Series in 1995 and 1997 under Hargrove’s leadership. He is ranked second on the club’s all-time managerial wins list. Indians Sr. VP of Public Affairs Bob DiBiasio said Hargrove and his wife, Sharon, have made Cleveland their home ever since he was traded here in 1979. Off the field, Hargrove volunteers with Our Lady of the Wayside and other community organizations.